Yesterday new Eminem's song - "Survival" - hit iTunes, and the video clip for this song appeared on Youtube. If you have watched Call of Duty: Ghosts multiplayer trailer, then you should remember "Survival", because that was the first time when the song was performed. But not only the Call of Duty: Ghosts multiplayer trailer contains the reference to Eminem. His new clip also has a lot of hints at the upcoming first-person shooter. The short fragments of Call of Duty: Ghosts gameplay, including the scenes with Riley (the dog of the game's protagonist), serve as a background to Eminem, who is passionately performing his song. 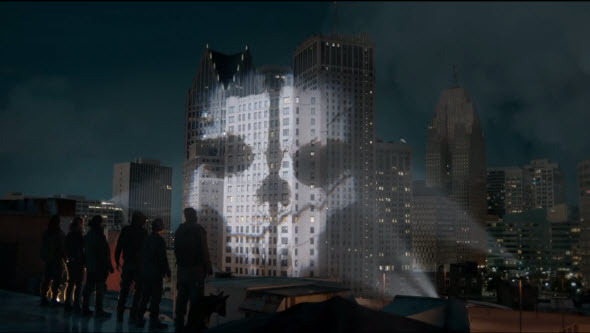 And at the end of the video the huge light signal that looks like the logo of the Ghosts game appears on the city's building. But seeing is believing, so we advise you to watch the new Eminem's video clip by yourself and leave your opinion about it in the comments below. Also we would like to remind you that those, who will pre-order Call of Duty: Ghosts game, will be able to get the discount on the new Eminem's album with an exclusive track inside. Take your chance!